Our boats are conveniently located near the Annapolis Chesapeake Bay Bridge on the Magothy River. Located only 20 minutes from Annapolis and less than 1 hour from the Baltimore Inner Harbor and Washington DC. Easy commute from Pennsylvania and Washington DC and Virginia areas. Enjoy a day on the Bay in one one of the most scenic and enjoyable areas of the Chesapeake Bay. Family Fishing and small Group charters for the mid and Upper Bay areas. We offer Chesapeake fishing light tackle fishing with live bait, Jigging and chumming. Bottom fishing for white perch and spot is always a treat. Capt. Frank has been chartering for over 20 years and specializing in family Fishing in the mid and upper Bay areas. Down Time is licensed for up to 6 passengers. 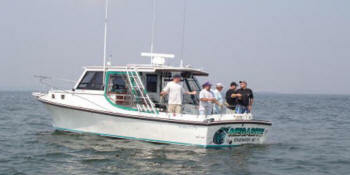 Enjoy light tackle Sport fishing Charters in the Maryland Chesapeake Bay. 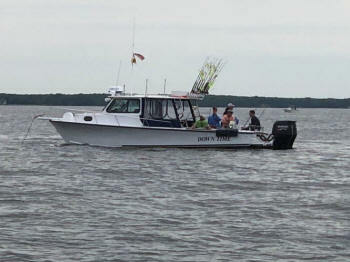 Fishing Chesapeake Bay for Trophy Stripers and Light Tackle Sport fishing. 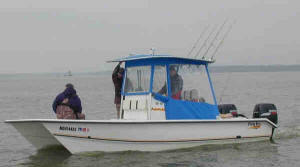 We do small group Sport fishing Charters, Light house Tours, Bay Cruising. Easy access from Baltimore, Pennsylvania, Virginia fishing the Chesapeake Bay from Annapolis to Baltimore, Rock Hall, Kent Island and points south. 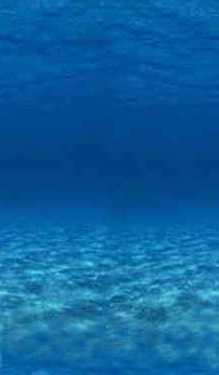 Let us arrange your complete charter trip. We have other boats available from the surrounding areas that we can call on and coordinate for your trip. All Charters can be booked directly with the Capt. of your choice. All payments and arrangements are made directly with the Captain of your choice. No Middleman or commission is involved. From Sandy Point to North Beach, Md.